Couple of activities around Shimla, at which one can spend a day, are river rafting upto Thattapani and the natural hot springs at Thattapani. 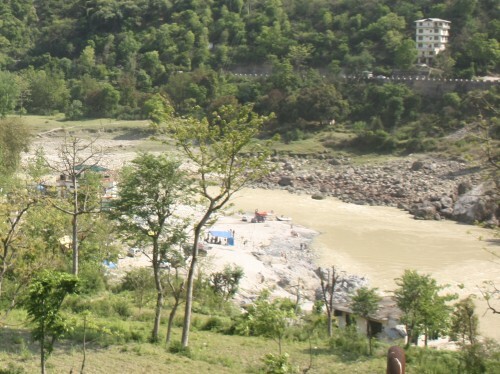 Situated around 55 kilometers away from Shimla, Thattapani is a good tourist spot on the river Sutlej. It takes about an hour and a half to reach the town Sunni by road. One can start the rafting from Sunni or from another town about 6 k.m. further upstream. Though it is referred as white-water rafting, there is not much of white water turbulence on this stretch of the river. Hence anyone and everyone can take part in the rafting. 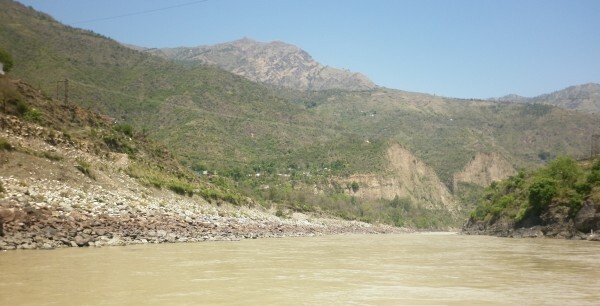 Some land slides visible on one side of the mountain, the deep canyon in which the river Sutlej flows through and the tan colour water from carrying all the silt from upstream makes it quite a beauty to enjoy. Himalayas are a unique beauty not found elsewhere. One wonders whether it could also become like a Grand Canyon in a few thousand years! Since there is no plateau around, this would still be called "Grand valleys" of the world, I guess. The people operating the rafting trips are quite professional in their approach with very good attention to detail. Even though it is not quite turbulent, they stick to processes to ensure that safety of individuals is not neglected. Taking care of our shoes & socks by taking them off before the rafting trip (and delivering it at the destination of the rafting trip), holding our valuables, cameras, etc., in a rubber dry bag, securing the rowing equipment onto the raft, etc., all carried out methodically by the team was impressive to watch. Later, they encouraged us to jump into the water to take a swim around the raft in the parts of the river where it was quite serene (still waters run deep we are taught - so we were quite reluctant, I guess). The water was quite cold - probably around 5 degrees centigrade. At the end of the trip, before real rough white water starts, we glide to the shores at Thattapani. 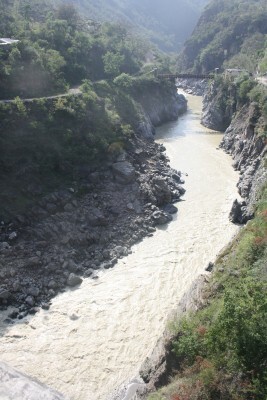 As we alighted, we found that the stones were quite hot, because we had been drenched by the cold water of the Sutlej. We were wondering whether the mid-day sun was the cause, when suddenly we found that even some parts of the sand were very hot after getting constantly drenched by the cold water! How was this possible? The answer is that some of the areas are being heated by the natural hot water springs. It really sent confusing signals to the brain when we moved from 5 degrees centigrade to 50 or 60 degrees sand/pebbles. It was a different feeling and we rushed back into water to avoid getting burns in our feet. Next we went to the nearby hotel named Hot Spring, where they have small swimming pools which are fed by natural sulphur hot springs. They have lot of boards in Thattapani (meaning hot water, I would guess) that mention many hotels providing the natural sulphur spring pools. We went to the hotel Hot Spring, took an elongated dip in the Sulphur hot springs and then continued on for lunch. There is excellent cooperation between the various teams that we were not asked to pay for anything from river rafting to sulphur spring dip to lunch. Everything was to be billed at our resort only! On the way to Thattapani or on the way back, one can take a trip around Naldhera which is home to one of the golf courses in highest location in Asia. A view of the Sutlej, down in the valley, flowing a few hundred metres below our view point, view of the farther mountains near the India-China border, etc., were available when visited on the back of a mule. We decided to skip it and take it up on a subsequent day. Courtesy and courteousness is seen from all people who provided us with various services. They know how to provide service, how to please customers and keep them in good books. They deserve tips from us, which they don't really insist and don't show their expectations for it either. It seems like "We provide excellent service and income/profits are a bonus" seems to be their motto. River rafting must have been thrilling...especially if you were at the front of the raft! Last time my brother went rafting he got badly sunburned. If you go, make sure to wear plenty of sunscreen. I want to go on a tour this summer. I think it would be a lot of fun.